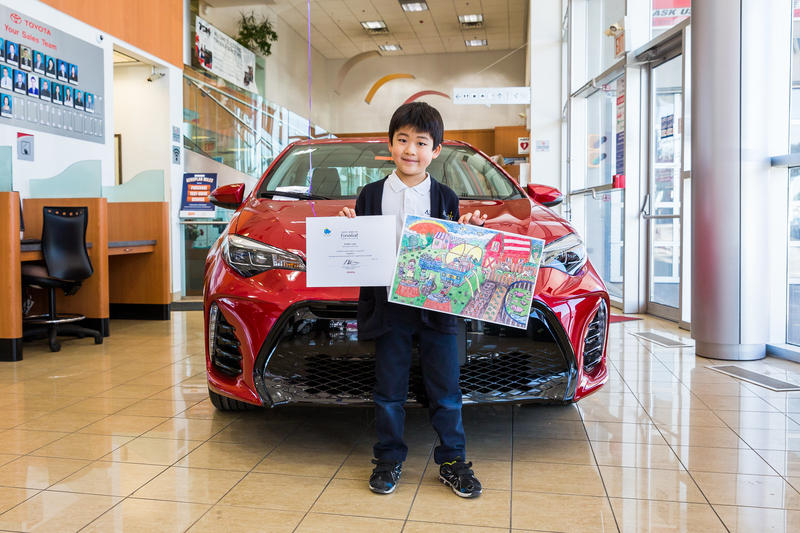 5-year-old Aidan Lau, is photographed holding his winning artwork in last year’s Canadian contest at his local Toyota dealership. (Toronto, ON – November 1, 2017) If your child is a dreamer with a passion for art and innovation, Toyota Canada Inc. (TCI) wants to see their vision for the future of mobility, transportation and technology. As of today, TCI has officially opened the 2018 Toyota Dream Car Art Contest to Canadian children up to 15 years of age. Children are encouraged to submit an artistic creation of their “dream car” for a chance to win one of nine CloudVR virtual reality kits and an entry in the global contest, where 30 finalists from around the world can win a trip to Japan. In last year’s contest, 10-year-old Ryan Liang, from Vancouver and 13-year-old Noelle Yau, from Vancouver represented Canada at the awards ceremony in Japan, where they were awarded gold and silver medals for their outstanding drawings. Ryan and Noelle’s artwork were among 30 selected from approximately 830,000 entries from 79 countries across the globe. “The Toyota Dream Car Art Contest provides children with a blank canvas to bring their visions of the future of mobility to life without any limits,” said Larry Hutchinson, President and CEO of Toyota Canada Inc. “I am blown away by the artistic ability, imagination and strong societal values expressed in the submissions we receive each year. Contest submissions are broken into three age categories: under eight, eight to 11, and 12 to 15. Three finalists in each age category will be selected by a distinguished panel of Canadian judges for a total of nine Canadian finalists. Prizes for the nine Canadian winners include a CloudVR virtual reality kit, along with an entry as one of Canada’s representatives in the global contest. Of the global contest entries, 10 finalists from each of the three age categories will be invited to attend the awards ceremony on an all-expense-paid trip to Japan with a parent/guardian. Entries can be submitted beginning today, November 1, 2017, until February, 2, 2018. Submissions can be created with any type of medium, such as paint, markers or crayons, but cannot be created digitally. All artwork must be made on paper no smaller than letter (8.27 X 11.69 inches) and no larger than tabloid (11-12 X 16.5-18 inches) size paper and must include a coloured background. The contest is open to all residents of Canada up to the age of 15.